It's time to make some short stays! 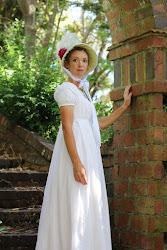 As I discussed in my last post, I decided to start by making some short stays from the Regency Underthings pattern by Sense and Sensibility. The pattern was pretty straight forward and most importantly, I could download it, print it out and start making it instantly! I tend to be impatient like that, not exactly compatible with historical sewing, I've discovered. None the less, I managed to work out how to print to scale and dived straight in. And that about did it! I wouldn't need to buy anything. This would be one of the the projects I could tell my husband was saving him money on! As stay-makers seemed to have learned by this era how to create lift using cups, boning wasn't so important. So these stays had very light boning in them. I planned on learning to work eyelets by hand, so that would be a challenge. All the pieces (it is a 5-piece pattern) are cut out of outer fabric, interlining, and lining fabrics. 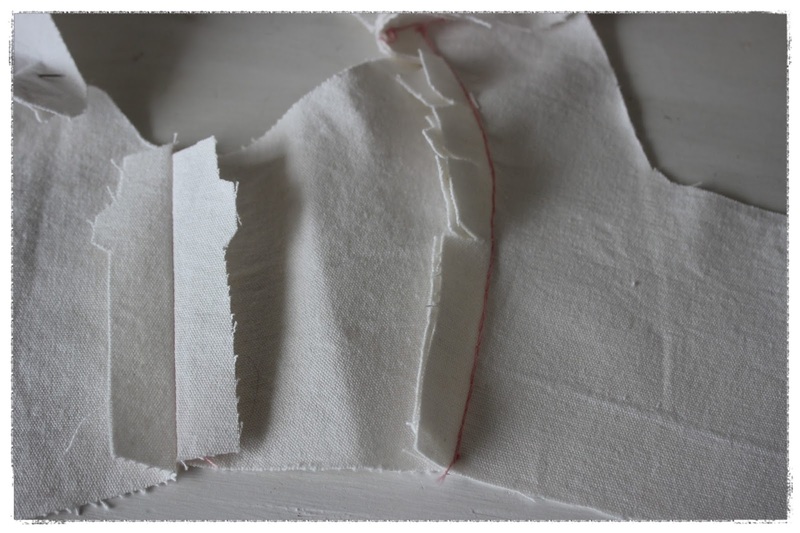 I started with the interlining as a 'practice'. This went pretty well, then I moved onto the lining and finally finished off with the outer fabric. 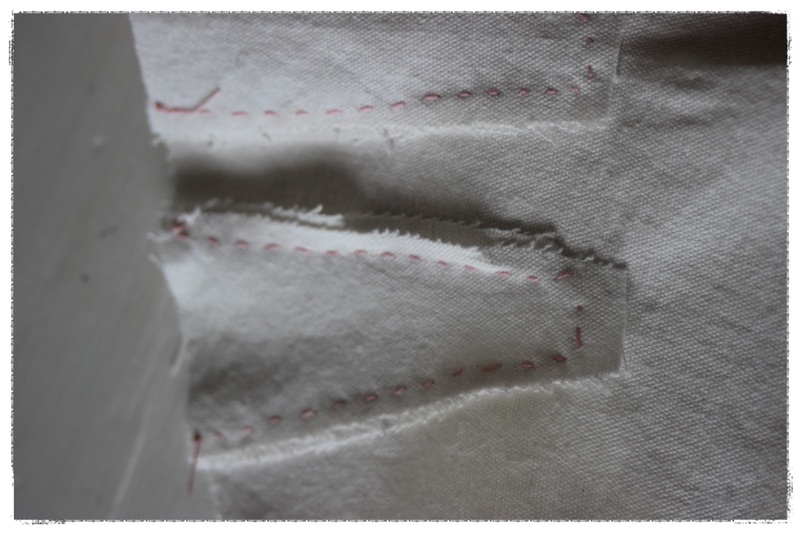 They did need to all match up nicely, so make sure you cut them correctly and use the same seam allowances! I used the B cup measurement, as I'm on the small side of C/larger side of B cup. I discovered this might be too small, so next time would make the C cup size. As it was a very small project, I did all the sewing by hand. Mostly I used a backstitch, assuming that the vertical seams would have the most strain on them. The first step was to sew up the gussets into the front bodice pieces. Cut out the cup slit and cut the corners diagonally. 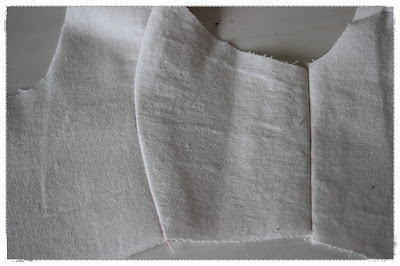 Press seam allowances out, pin the cup gusset over the seam allowance. 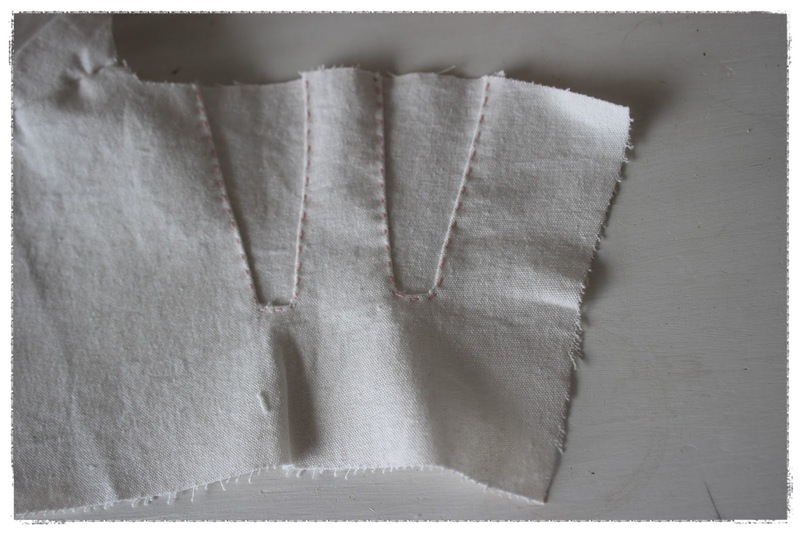 Sew from the outside neatly (I used a running stitch). Finish off by pressing. Complete all four gussets. After this, I sewed all the seams up using a backstitch. I pressed the seams and clipped the curved ones. At this stage, I tried it on, decided that it fit just fine, and continued with the same for the other two layers. After this, I placed all the layers together, interlining right side out, lining right side in of course, and pinned. All the seams are then stitched through all the layers using a running stitch, preferably as close to the seams as is possible so as to be unseen ideally. I basted all of the top, sleeve and front edges at this stage. Next I worked the eyelets at the front edge. I'm definitely not happy with my eyelets, and since then did a bit more research on YouTube to find some better examples on how to do these. I'm still working on it! Following this the centre front is bound (I used lambskin). Next it's time to bone it, only on the front panels as this era used light boning. The channels are stitched using a running stitch or a backstitch from the outside, followed by some decorative quilting. Needless to say, as this is a practice one, I skipped the quilting! The boning is then inserted. The last stage is to bind the raw edges. I used my lovely soft lambskin for this again, and learned to mitre the corners for a smarter finish. Still some improvements to go there! Interestingly, this pattern uses the bottom binding as a channel for a drawcord, which is useful. Some sources suggest the same for the neck-line binding, and it you have difficulty with it gaping this is a great option! Altogether, I'm happy with this project! It's a little snug, so next time I'd make a mockup in a larger cup size, but the general dimensions are good otherwise. The sewing was simple and quick, and they seem like they'll keep me in the right silhouette for hours without any discomfort.